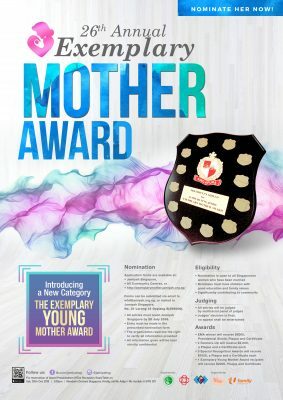 This prestigious award seeks to find outstanding mothers (regardless of race or religion) who are role models for their family, community and society. The award is to recognise mothers for their strength, commitment and ability to develop a cohesive family unit while also play an active role in the society. For the first time, a new category has been introduced – The Young Exemplary Mother Award, for mums who are 35 years or younger. If you know of any of such inspirational mothers, click here to nominate them. Attractive cash prizes await the finalists. Click to nominate that deserving candidate you know! Join us too at the Award Presentation on 20th Oct, 3pm at Mandarin Orchard Hotel. The Guest of Honour for the event is Her Excellancy Mdm Halimah Yacob, President, Republic of Singapore.